Large Outdoor Door Mats Rubber Shoes Scraper 36" x 24"
OUTDOOR MAT: Doormats dimensions measure 24in X 36in, 1/8 inch thick. Heavy duty large and long door mats entrance durable rug carpet widely used for all weather outdoor front door, exterior patio entry way, porch door, garage, garden, winter, commercial deal with high traffic inside and outside. NON-SLIP: Comes with already build in non-skid rug runner pad mat with natural rubber back for maximum grip to prevent you to skid while you walk. LOW PROFILE & FASHION: Its floor-hugging design will keep it from snagging on swinging doors. 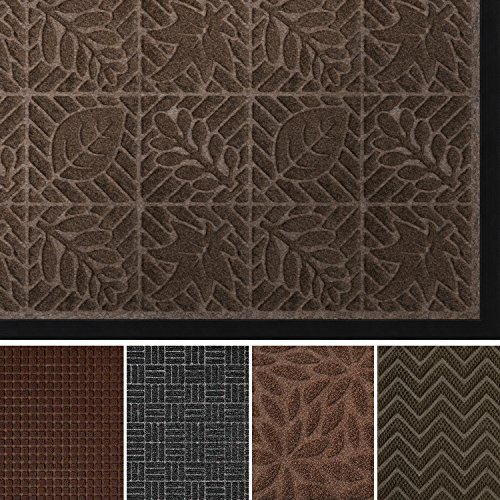 This brown leaf design, personalized, rectangular, decorative, stylish, rattan, waterproof is suitable for modern homes. SCRAP DIRT & EASY CLEAN: Durable utility polyester fibers scrap off dirt, dust, grit, mud, grass or snow and absorb moisture from shoe. Spray down with a nozzle on a garden hose or brush this washable door mat. SATISFACTION GUARANTEE: We have a 30-day guarantee for return or replacement. If you are not totally happy with the purchase, return it hassle-free for a full refund. If you have any questions about this product by AMAGABELI GARDEN & HOME, contact us by completing and submitting the form below. If you are looking for a specif part number, please include it with your message.